I've been rereading Calvin and Hobbes quite a bit recently, and a couple of strips stuck out to me. 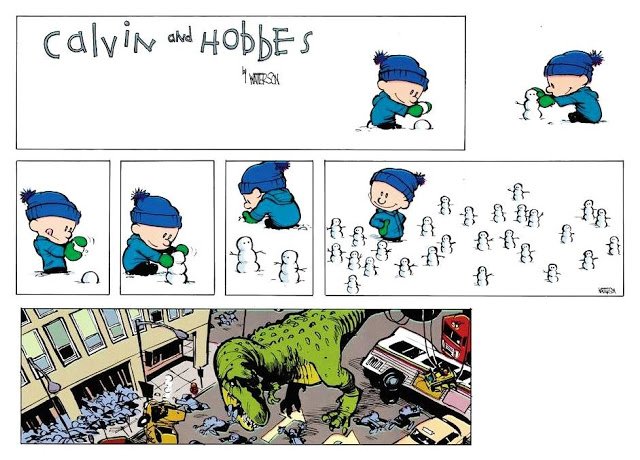 Calvin and Hobbes is a strip about, among other things, imagination. A boy has a stuffed tiger that his imagination brings to life, even if just for him. This is pretty straightforward. When Ms. Wormwood is in the frame, or speaking within the confines of the panel, Hobbes is depicted as a stuffed animal. When it's just Calvin, Hobbes is real. We get it. Our brains fill in the gap. This is a process called "closure," the idea being that in this series of still images, our brains will fill in the blanks — the literal blanks that take place in between panels. That little white space is called the "gutter." So that strip above has a very explicit visual cue: Calvin is in all the panels and we can connect stuffed Hobbes to real Hobbes. This is something we take for granted now, but consider that this was only the fourth strip of the series and at a time when most comics felt overexpository. 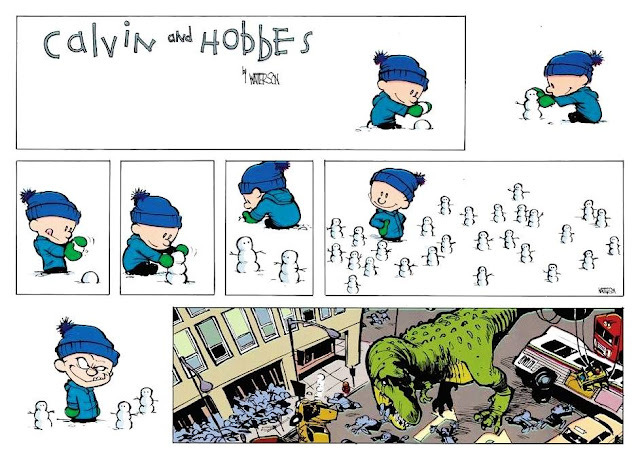 In a DC or Marvel comic, an editor might have had Watterson put in a caption to the effect of "Calvin's mind brings Hobbes to life!" in panel 3. But it's not necessary. We can fill in the cues. Here's another that's even more fascinating to me. There is nothing in that second-to-last panel that's in the last one. There is nothing that visually carries over. And yet our brains fill in the blank anyway. I'm going to make one change to this strip. Let's see how it affects the reading experience. You've already read the strip as it's meant to be, so I'm not gonna ask you if the transition is still clear. But doesn't it feel super off all of a sudden? There's as many items in the now-second-to-last panel as there are in the actual second-to-last panel that are in common with the last panel. The trick is Calvin's grin. It's essential. Going from happy Calvin to the dinosaur ruining the city is so random, but seeing Calvin's mischievous grin knows he's up to something, allowing us to connect the visual of a giant destroying tiny people with another giant destroying tiny people. It's interesting that our brains work that way. We take it for granted. Growing up in a time when most comics felt overloaded with exposition, it's impressive how little hand-holding Watterson did. In his TED Talk, "The Clues to a Great Story," Andrew Stanton says: "Make the audience put things together. Don't give them four, give them two plus two. The elements you provide and the order you place them in is crucial to whether you succeed or fail at engaging the audience." Calvin and Hobbes is a story about imagination, and Watterson does a perfect job of taking us along Calvin's mind trips by not explaining everything to us and letting our brain fill in the gutters and provide closure. He makes our brains work, even if we don't realize that's what it's doing. He was incredible. 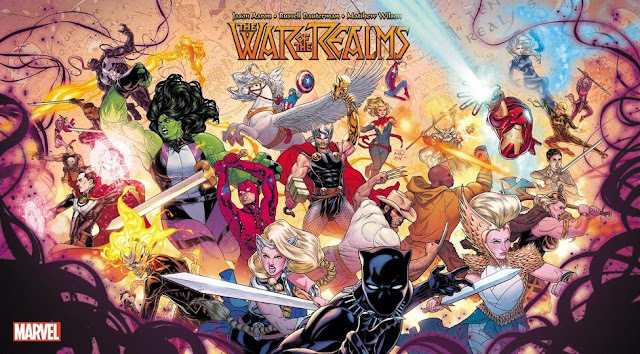 *I mention "a reader who can read comics" because I believe reading comics is a skill that comes naturally to some and not so naturally to others. I read about a teacher, years ago, who was trying to teach comics, and as an example, he showed two panels: one of the sun above the ground, and one of the sun halfway to the ground. He asked the class how they saw the panels, and some of the class said it was a setting sun, while some of the class said it was two separate pictures of a noon sun and an afternoon sun. Reading comics is a skill that not everyone naturally gets into. In the last Calvin and Hobbes example, someone unskilled in reading comics could easily interpret it as a picture of a dog and a picture of Calvin and his dad, unconnected.